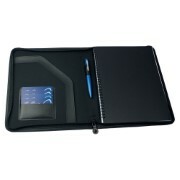 Manufactured from imitation leather with peach skin interior this compendium comes with a 100 page lined spiral pad. We would love to help you with a custom quote. Mention NOTTAGE-9199BK. Just call 1800 674 722 or get a custom quote.